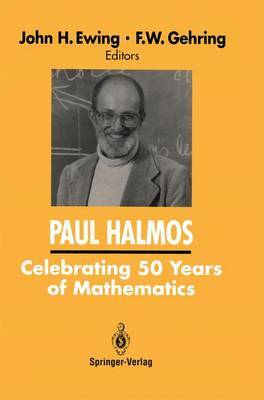 Paul Halmos will celebrate his 75th birthday on the 3rd of March 1991. This volume, from colleagues, is an expression of affection for the man and respect for his contributions as scholar, writer, and teacher. It contains articles about Paul, about the times in which he worked and the places he has been, and about mathematics. Paul has furthered his profession in many ways and this collection reflects that diversity. Articles about Paul are not biographical, but rather tell about his ideas, his philosophy, and his style. Articles about the times and places in which Paul has worked describe people, events, and ways in which Paul has influenced students and colleagues over the past 50 years. Articles about mathematics are about all kinds of mathematics, including operator theory and Paul's research in the subject. This volume represents a slice of mathematical life and it shows how many parts of mathematics Paul has touched. It is fitting that this volume has been produced with the support and cooperation of Springer-Verlag. For over 35 years, Paul has contributed to mathematics publishing as founder and editor of many outstanding series.